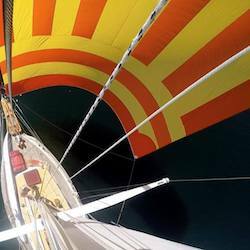 You wouldn’t imagine the importance of sending your spinnaker around the forestay from the comforts of the cockpit. The suggested method that has been the standard for a Westsail is tedious to say the least. 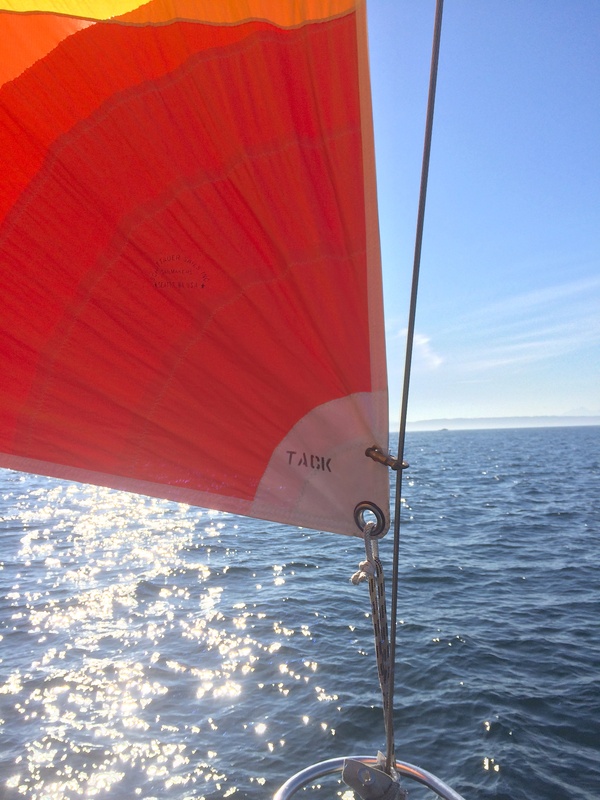 My previous post outlines the steps required to fly the asymmetrical spinnaker the old fashioned way. I really wanted to make it simple and also make the rigging more modular, instead of fixing all of the hardware and leaving everything sitting out in the weather. The basic principal is just to make the tack-line blocks, shackles, etc. easy to rig and take down. The spinnaker is pulled through the forward hatch from below to ready it for deployment. 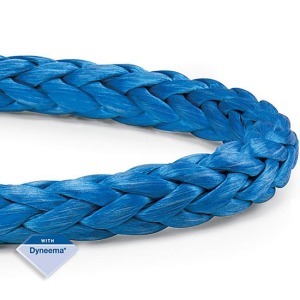 The sheets are a spliced loop, both attached with the same soft shackle. The tack-line is attached to the tack with a spliced loop and soft shackle. 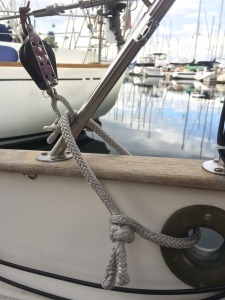 The tack-line is held fast using a simple fiddle block, which is looped around the forward end of the boomkin using a soft shackle. The sheet blocks are also attached using soft shackles. It’s all completely removable, aside from the spinnaker halyard and everything can be stowed down below. It takes just a few minutes to pull everything out of the bag and rig it for flying the kite. I took a trip to Port Ludlow this weekend, since crabbing opened back up and I have always wanted to check out the bay. Anchorage is soft sand with little winds and currents. 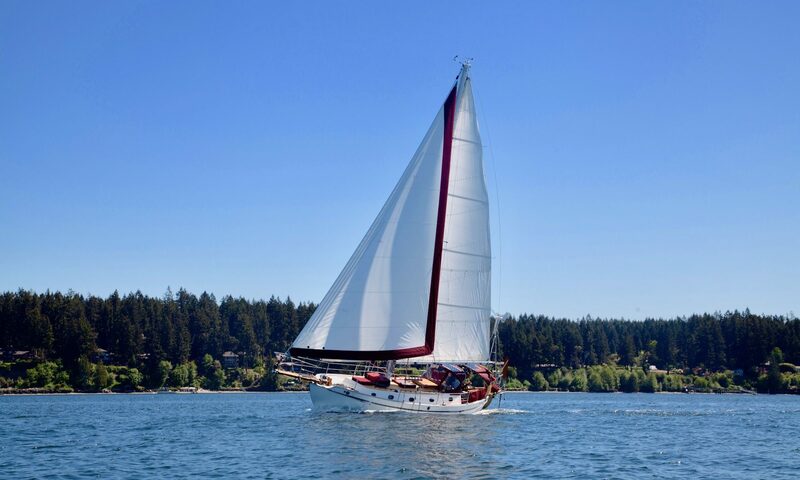 The winds did not cooperate much so we motored the entire way until we were near Mutiny Bay on Whidbey Island and then started sailing. Winds were variable, never reaching more than ten knots. We did some sailing until we were near Colvos Rocks and managed to sail most of the way to Ludlow. Once the winds died we motored to our anchorage close to the south side of the marina. 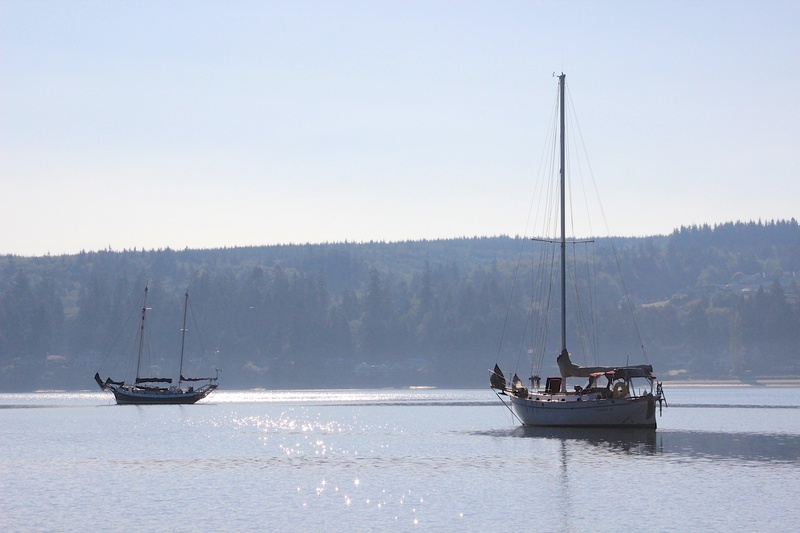 Port Ludlow is really just a resort and a marina on the water with lots of condos, lots of private land and not much to do. We decided to have dinner at the resort but I was blown away at the $35 cost of a hamburger, chowder and a beer. My fault for not stocking the fridge before departing Seattle. We caught one rock crab and I boiled it on the boat after dinner, then froze the legs and ate the rest, disposing of the shell right where it was caught. Lots of little ones falling from the pots. The next morning I took Sasha to the shore next to the marina to do her normal morning routine of potty and stick play. 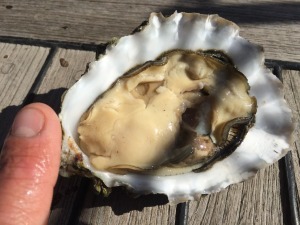 On the way back to the dinghy I discovered some Pacific oysters in the sand at low tide. Since it’s really difficult to determine the legality of oysters outside of the general rules posted on the WDFW website, I used my best judgement and harvested just enough for breakfast. We were anchored on the beach that we harvested from so we were able to return the shells as required by law. As far as that land being private, open for harvest or closed…I haven’t the foggiest. Even after returning home and doing extensive internet research I was still unable to come up with the definitive answer. The best I could find was some interactive map about biotoxins that indicated that the beach was closed to pollution. The interesting thing about this map is that it also shows the entire coastline from Marysville to South Seattle closed. Harvesting shellfish used to be so simple. We departed Port Ludlow, motoring pretty much the entire way to Edmonds because of the lack of winds. Once they picked up, it was all of the sudden a perfect sail downwind with the spinnaker. She sailed beautifully on a 120 to 150 degree run. We did a couple of outside jibes that were successful and one that was a disaster. Nothing was damaged but I will remind everyone that a knot in the sheet that is supposed to be released can cause a lot of tension before getting it all squared away. I ended up heading up with spinnaker flogging to get it taken care of. Next time that happens I know to simply ease both sheets and snuff it until everything is back in order or just head back to the opposing tack to take in the line. 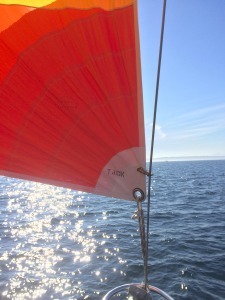 I’m new to the art of the outside jibe and eventually I hope to make a perfect jibe, sheets positioned exactly where they should to prevent the sail from deflating. Just turn, pass around and then all at once the sail is set. For October it was a nice weekend. The weather held and it was almost back to summer again. The new rigging was a success aside from a few small tweaks. I’m much more comfortable flying a kite when on a downwind run. Another exciting moment this past week was the deposit I paid out for the new mainsail. We had already picked out the fabric and preordered it for the construction of the mainsail. When it was presented to me, it reminded me of when I once worked for Feathered Friends between 2001 and 2005. The owner, Peter Hickner took textiles very seriously and it was really the basis for any product. 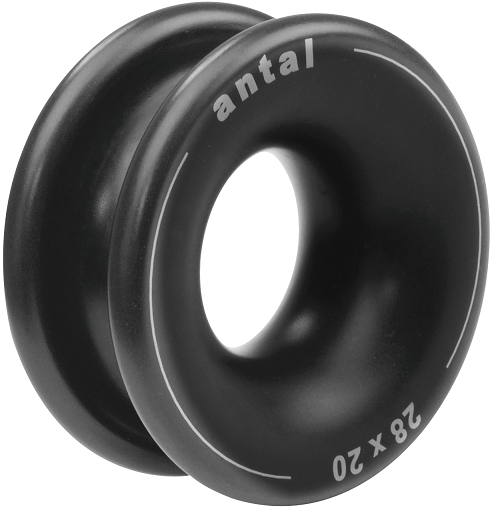 No matter how well the product is constructed, it is the materials in the construction that will enable a manufacturer to make the final product superior. Frank seemed very satisfied with his choice of sailcloth and from that point on I knew it was a serious endeavor to produce the best mainsail he could with his brother Axel. So the discussion led to some basic ideas on performance through full battens and the leech shape. The decision to place the reef points at specific heights was fore-thinking for when the trysail would be deployed instead of making it without that consideration. I opted for full battens, a handmade boltrope, two reef points and requested that he consider the Westsail’s weather helm tendencies, for lack of a better term. There are still plenty of projects on the list. More canvas, rigging, rebuilds, cleaning, etc. Until I have a new set of sails, I cannot think too far ahead and I need to be careful about taking on too many projects. The budget for the next three months is set and expensive. Aside from the new sails I also have new rigging to install for both the jib and staysail. There is a lot to consider before making a decision. By January I hope to have it all figured out, even if I have not completed the tasks. What furling system do I buy? Should I add another winch for the staysail sheet and furling line? Should I do a traveler for the staysail? Should that be sheeted with a winch, block on the clew or both? Where do I mount the new winch and run the lines to? Too many questions… I still have plenty of time to decide, and plenty of wisdom at my disposal to make a good decision. Until then I can focus on simple canvas projects, repairing what I can and sailing.